Recently, I've been avoiding telling my son that he's smart. Not because he's not smart. Because I think he is smart, at least going by his maths scores, which are usually excellent. But I decided to heed the growing movement in education that says children should not be praised for innate intelligence or gifts. Talk about talent is almost taboo in some circles. I read about these ideas a while back but it's taken me a while to get on board. Because weren't we supposed to praise our children to encourage them? Weren't we supposed to cut down criticism, commonplace in previous generations, and boost self-esteem? And isn't talent something so prized, so desired in our children? Forgetting names, misplacing keys or getting lost in a familiar place may not simply be signs of old age. 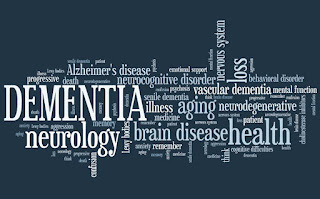 There could be an underlying medical condition – dementia. “Dementia refers to a group of symptoms including memory loss and loss of independent function,” explains Dr Nagaendran Kandiah, Senior Consultant, Department of Neurology, National Neuroscience Institute (NNI), a member of the SingHealth group. Dementia is a brain disease. It is not part of normal ageing. Forgetting names, misplacing keys or getting lost in a familiar place may not simply be signs of old age. 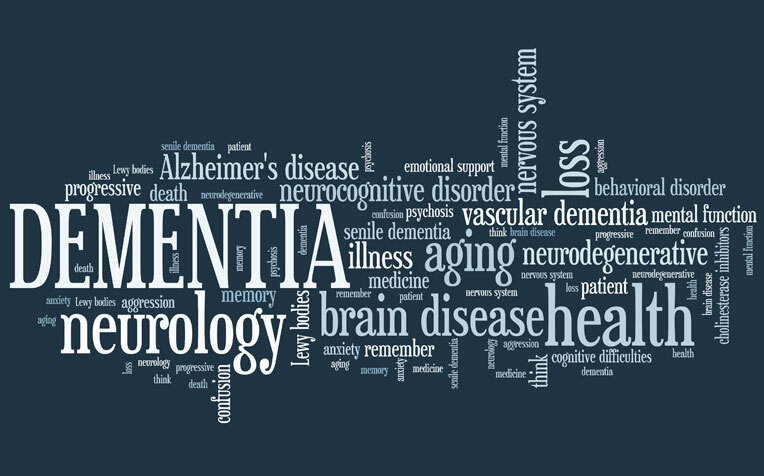 There could be an underlying medical condition – dementia. Sufferers may find their mental capacity declining progressively along with a reduction in their ability to function normally. Dementia has early signs that are insidious, and patients are usually unable to pinpoint exactly when the symptoms first appeared. The RCEP was launched at the 21st ASEAN and Related Summits in Phnom Penh, Cambodia in 2012. The negotiations for the RCEP commenced in 2013. The RCEP initiative aims to be an ASEAN-led process through which ASEAN would broaden and deepen its economic engagements with its FTA partners. The RCEP would lead to greater economic integration, support equitable economic development and strengthen economic cooperation among the countries involved. The RCEP has the potential to transform the region into an integrated market of more than three billion people (over 45% of the world’s population), with a combined GDP of about US$ 17.23 trillion, which is about a third of the world’s current annual GDP. Regional Comprehensive Economic Partnership (RCEP) is a proposed free trade agreement (FTA) between the ten member states of the Association of Southeast Asian Nations (ASEAN) (Brunei, Burma (Myanmar), Cambodia, Indonesia, Laos, Malaysia, the Philippines, Singapore, Thailand, Vietnam) and the six states with which ASEAN has existing FTAs (Australia, China, India, Japan, South Korea and New Zealand). RCEP negotiations were formally launched in November 2012 at the ASEAN Summit in Cambodia. RCEP is viewed as an alternative to the Trans-Pacific Partnership trade agreement, which excludes China and India. There are a lot of conversations happening right now about the Trans Pacific Partnership (TPP), especially within the US who is leading the charge for this trade agreement. On the other side of the world, China is pushing a different trade agreement - the Regional Comprehensive Economic Partnership (RCEP). Both agreements could revolutionize trade across the world – the TPP has been called NAFTA on steroids while the RCEP could possibly untangle the Asian noodle bowl of trade agreements. Even though both sides have publicly stated that the agreements will be done by the end of 2015, the reality is with the opposition strong for both and some major obstacles still ahead, it may likely push well into 2016 before anything concrete is produced. On November 3-4, the RCEP Ministerial Conference was held in Cebu, Philippines. Vice Minister of Commerce Wang Shouwen, leading the Chinese delegation consisting of members from the Ministry of Commerce, the Ministry of Finance and the Ministry of Agriculture, attended the conference. The participating ministers reiterated the leaders ’instruction on how to conclude RCEP negotiations quickly, and how to evaluate the progress of the negotiation comprehensively. They also had in-depth discussions on key issues in the three core fields including trade in goods, service trade and investment, and provided strategic guidance for the next negotiation. The participating ministers welcomed the completion of the chapter on economic and technological cooperation during the 15th round of negotiation held in Tianjin, China. The important progress generates power for the negotiations, and will contribute to narrowing down the development gap among the member countries. The effective implementation and application of the agreement will maximize the benefits of RCEP. The participating ministers urged the officials to take part in the negotiations, grasp the active power brought by the above progress, remain strong willed, make great efforts, and reach a modern, comprehensive, high-quality and reciprocal RCEP agreement according to the requirements in the Guiding Principle and Goals of RCEP Negotiations. Besides, against the background of the globally weak economy, unbalanced growth of the developed economies , the slowing-down growth of emerging markets, the weak expectation of global trade growth and the rising sentiments for the trade protectionism, the ministers emphasized the urgency of concluding RCEP negotiations through a package solution. They thought this will help the confidence of the world economy. 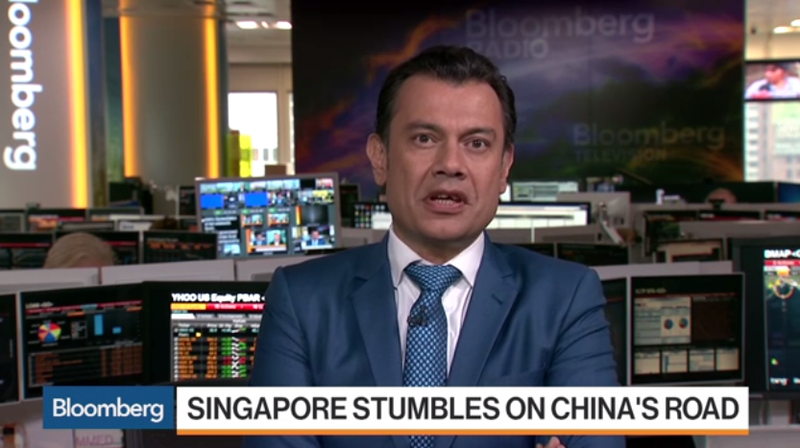 Sweeping change is afoot in Asia. China has clearly become the single biggest power within Asia, and Beijing has outlined clear visions for its diplomatic and economic aspirations across the region and beyond. Washington, on the other hand, is seemingly going the other direction and less willing to be as formidable a Pacific presence as it has been. Having spent over seven decades defining and protecting regional security, there are growing doubts about U.S. commitment to the Asia-Pacific region, and how Washington views its future as a Pacific power. One issue, however, is clear. Asia remains not only the world’s most populous region, but also the most dynamic economically. As a slew of multilateral frameworks for cooperation emerge, the question remains whether any of them will be successful in ensuring continued growth across Asia and the world. Of course, there is broad consensus among Asian nations that political and economic stability go hand in hand. There is also a shared belief that increased exports can lead to growth, and that the region could benefit from greater investment in infrastructure development. Yet there is concern that some of the proposals currently under consideration could actually increase tensions, rather than encourage greater cooperation, given the competing visions for leadership in Asia. related: FTAs in East Asia: Economic Integration or Economic Spheres of Influence? Developments in forming alliances among regional and global economic partners have emerged very strongly in recent times. The Tans Pacific Partnership (TPP), Regional Comprehensive Economic Partnership (RCEP) and the Asian Infrastructure Investment Bank (AIIB) are notable not just as major alliances but more importantly for the change they are likely to cause to global economy and commerce in the days ahead. The Trans-Pacific Partnership (TPP) is a proposed trade agreement among twelve Pacific Rim countries concerning a variety of matters of economic policy, about which agreement was reached on October 5, 2015 after 8 years of negotiations. 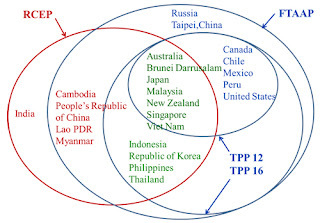 Member countries of the TPP are: Brunei, Chile, New Zealand, Singapore, Australia, Canada, Japan, Malaysia, Mexico, Peru, the United States and Vietnam. Total population of TPP countries is 11 per cent of the global population. Total GDP of TPP countries is US$ 27.64 trillion. 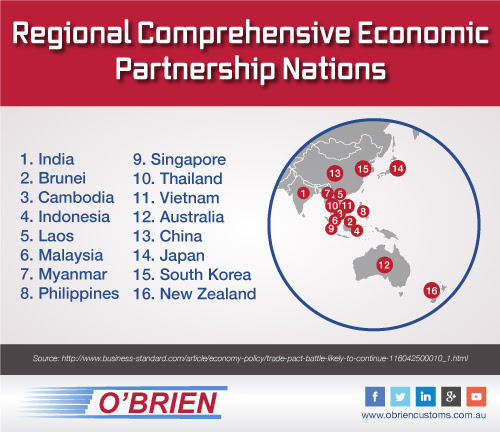 The Regional Comprehensive Economic Partnership (RCEP) is a FTA negotiation that has been developed among 16 countries: the 10 Members of ASEAN (Brunei, Cambodia, Indonesia, Laos, Malaysia, Myanmar, the Philippines, Singapore, Thailand, and Vietnam) and six other countries with which ASEAN has Free Trade Agreements (FTAs) – Australia, China, India, Japan, Korea, and New Zealand. In relation to RCEP these six non-ASEAN countries are known as the ASEAN Free Trade Partners (AFPs). The participants in the RCEP FTA negotiations have a total population of over 3 billion people and a trade share estimated at around 27 per cent of global trade (based on 2012 WTO figures), covering GDP of around $US21 trillion (2013 IMF figures). After the United States' recent diplomatic disaster of trying to prevent general adherence to China's Asian Infrastructure Investment Bank (AIIB), US policy makers have been under pressure to strengthen their presence in Asia on the trade front: By concluding the Trans-Pacific Partnership (TPP), a potentially historic trade agreement linking the US, Japan and ten other countries, China would see its goal of reducing Washington's presence in its neighborhood severely thwarted. Furthermore, the TPP would connect the United States to the economic center of the 21st century, one of the fastest-growing regions of the world, and cement its relationship to Japan, its key ally. It would be the first real manifestation of Obama's pivot to Asia, which so far consisted of mere rhetoric. China, which is excluded from the countries negotiating the TPP, has responded by promoting the Regional Comprehensive Economic Partnership (RCEP), which excludes the United States, and which would promote rapprochement between Beijing and Tokyo. The tussle for regional influence between the United States and China has thus also taken hold of the debate about trade agreements. 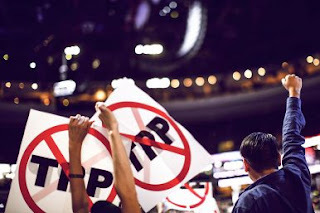 Just like the TTP, the RCEP, whose negotiations were launched at the ASEAN Summit in Phnom Penh in November 2012, would connect a large chunk of the global economy, placing China and Japan at the center, and harmonize trade-related rules, investment and competition regimes. The RCEP includes a vast array of rules about investment, economic and technical cooperation, intellectual property, competition, dispute settlement and government regulation. Notably, India, set to play key economic role in Asia in the coming decades, is also part of the grouping. 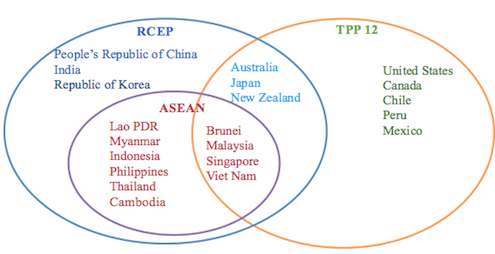 TPP and RCEP: Boon or Bane for ASEAN? 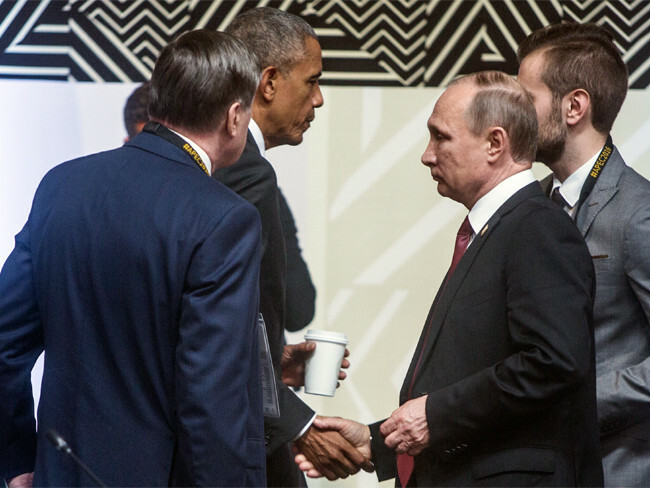 2015 is a critical year for the Asia-Pacific region. The Trans-Pacific Partnership (TPP), backed by the U.S. Senate’s recent approval of “fast-track” authority, is now entering the final round of negotiations in Hawaii. 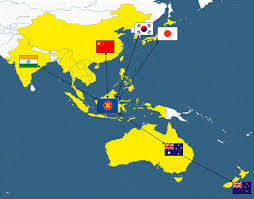 Another Asian free trade agreement (FTA), the Regional Comprehensive Economic Partnership (RCEP), is also due by the end of 2015, with a round of substantive talks in August and another to come in October. With TPP spearheaded by the U.S. and RCEP led by China, there has been a lot of attention lately on how the two countries are using the FTAs to benefit themselves and keep each other out of their respective regional economic arrangements. Meanwhile, the Association of Southeast Asian Nations (ASEAN) and its member states are also playing an important role in the future of trade arrangements in the Asia-Pacific. As its economic cooperation and integration efforts have reached a crucial stage, ASEAN is concerned not only about the welfare effects of TPP and RCEP on its member states, but also about their impact on the development of ASEAN as an economic community. One of the most widely recognized benefits for ASEAN of these high-level regional agreements is to calm the “noodle bowl” effect of small, overlapping FTAs. As common frameworks, RCEP and TPP are expected to help unify the trade standards in ASEAN’s other FTAs. However, recent studies, including a working paper from the Asian Development Bank, have expressed concerns that the two FTAs may affect ASEAN solidarity and hinder its internal economic cooperation and integration. East Asia is moving from business-driven integration to institution-driven integration, where the multilateral norms and principles are to be maintained. China’s rapid growth fueled the growth of the entire region, increased integration, on the other hand, made the region vulnerable to the risks of dependence on China’s economy and hence, the fluctuations of the global market. Despite the importance the Asia-Pacific trading system, the task of building regional institutions has been very crucial. Two major trade agreements, TPP and RCEP, stand to define the parameters of economic integration in Asia, arguably the world’s most dynamic region. The Asian Development Bank estimates that the region’s developing countries will grow by 6.3 percent in both 2015 and 2016, making it one of the most dynamic regions in the world. The rise of mega-regionals—such as RCEP, and the TPP suggests that the world trade system is more like a jigsaw puzzle than a spaghetti bowl these days. TPP and RCEP are part of the efforts to disentangle the “spaghetti bowl” of different agreements. 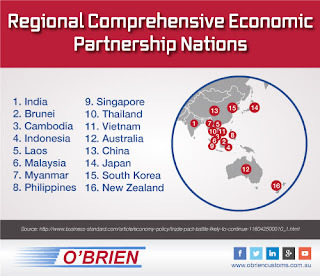 The Regional Comprehensive Economic Partnership (RCEP) is a multi-regional economic partnership between, includes the ten (ASEAN) member countries, plus the big three in Northeast Asia – China, Japan, South Korea – as well as Australia, New Zealand, and the powerhouse on the other side of the region, India. There are 16 countries involved in RCEP: the 10 members of ASEAN—Brunei-Darussalam, Cambodia, Indonesia, Laos, Malaysia, Myanmar, the Philippines, Singapore, Thailand and Viet Nam plus the six countries with which ASEAN has free trade agreements—Australia, China, India, Japan, Korea, and New Zealand. These six countries are known as the ASEAN Free Trade Partners (AFPs). All RCEP countries have now submitted initial offers for trade in goods and trade in services, as well as initial reservation lists for investment. Initial requests have been submitted in goods and services by most countries, and some requests have been submitted in relation to initial reservation lists in investment. Trade in services market access negotiations continue on a bilateral and plurilateral basis. Consultations and engagement on investment liberalisation continued on the basis of a negative list structure. In goods, negotiators continued to engage in discussions on the way forward, in light of the statement last year that leaders were looking forward to the conclusion of RCEP negotiations in 2016. The negotiations also advanced consideration of how to respond to concerns expressed by business in many countries about non-tariff measures. 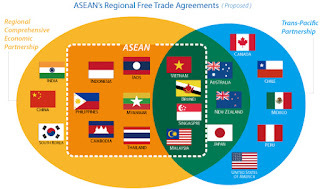 While China is in RCEP, Regional Comprehensive Economic Partnership (RCEP) is a proposed free trade agreement (FTA) between the ten member states of the Association of Southeast Asian Nations (ASEAN) (Brunei, Burma (Myanmar), Cambodia, Indonesia, Laos, Malaysia, the Philippines, Singapore, Thailand, Vietnam) and the six states with which ASEAN has existing FTAs (Australia, China, India, Japan, South Korea and New Zealand). But not only it RCEP just first step before China next step for bigger Economic partnership. China master economic program its called "One Belt, One Road"
The Silk Road Economic Belt and the 21st-century Maritime Silk Road, also known as The Belt and Road (abbreviated B&R), One Belt, One Road (abbreviated OBOR) or the Belt and Road Initiative is a development strategy and framework, proposed by Chinese paramount leader Xi Jinping that focuses on connectivity and cooperation among countries primarily between the People's Republic of China and the rest of Eurasia, which consists of two main components, the land-based "Silk Road Economic Belt" (SREB) and oceangoing "Maritime Silk Road" (MSR). While the WTO Ministerial meeting in Bali in December may deliver on individual initiatives related to such themes as agriculture, trade facilitation and development, a major breakthrough on the “single undertaking” is far from sight. At the same time, mega-regional agreements are fast emerging as a key feature of the global architecture. This “new regionalism” could pose risks, but successful mega-accords will create a strong incentive for a global accord; hence, the “new regionalism” will arguably be a powerful “building bloc” that will ultimately support multilateralism. Mega-free trade agreements on the horizon - The Transpacific Partnership (TPP) and the Regional Comprehensive Economic Partnership (RCEP) are two mega-regional agreements notable for their sheer size, overlap, and comprehensiveness. Moreover, the 2010 APEC “Yokohama Vision” aims to bring together members of these groups into a Free Trade Area of the Asia-Pacific (FTAAP) with negotiations to begin in 2020. 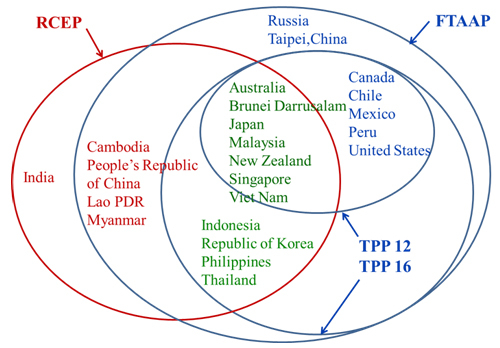 Figure 1 shows the membership in each of these organizations, including two versions of the TPP: existing negotiating members (TPP12) and a possible scenario in which Indonesia, the Republic of Korea, Malaysia, and Thailand, join (each has expressed some interest in doing so), the TPP16. If negotiations go according to plan, these mega-free trade agreements (FTAs) could be in place within ten years and completely in effect within twenty years. The “noodle bowl” of Asia-Pacific bilateral FTAs is giving way to the economic logic of consolidated regional FTAs that not only reduce the negative effects of bilateral FTAs but are more conducive to production networks that have been driving trade and investment in the region. This “new regionalism” will cut costs associated with bilateral FTAs and has many advantages over noodle-bowl bilateralism. It offers great economic benefits and a vision of future of global free trade. Regional Comprehensive Economic Partnership (RCEP): An attack against TPP? Ultimately, RCEP aims to provide pathways to free trade area throughout the Asia-Pacific. It provides a basis for a more open trade and investment in this region and addresses concerns about overlapping bilateral agreement through regional liberalisation. This is in line with the Australian government’s strategy for lowering trade barriers and securing improved market access for Australian exporters of goods and services, and for Australian investors. US President Barack Obama's landmark Trans-Pacific Partnership Agreement was already on life support before his successor, Donald Trump, promised American voters worried by the impact of globalization that he would kill it and bury it. Now that the Republican-dominated Congress has announced it will not discuss ratification of the TPP during the remainder of Obama's term, all that is left for the outgoing president to do is to read the funeral oration for the proposed Pacific Rim trade pact that had been the keystone of his administration's so-called "pivot to Asia" strategy. That may come when Obama joins other leaders for the Asia-Pacific Economic Cooperation meeting in Lima, Peru, on Saturday and Sunday. Donald Trump’s unanticipated, colossal victory has shaken up all prospects of ratifying a deal on the Trans-Pacific Partnership (TPP) and this may radically change the talks on free trade in Asia, Kommersant business daily writes. At the APEC summit on November 19-20, China is expected to promote an alternative project - the Regional Comprehensive Economic Partnership (RCEP). Russia’s key initiative at the summit will be suggesting that the Eurasian Economic Union (EAEU) should become one of the platforms for integration in the region. Director of the Russian APEC Study Center Tatyana Flegontova told Kommersant that this year, the parties hammered out a strategic study on the prospects of the Free Trade Area of the Asia-Pacific (FTAAP). If the TPP and the Regional Comprehensive Economic Partnership (RCEP) had previously been considered a keystone, this time the feeling is "we managed to show our colleagues that we will be able to participate in this zone only as the EAEU." 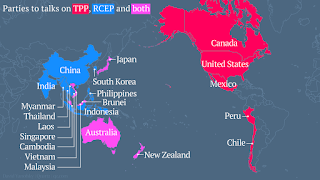 The TPP has more chances to be created now than the free trade zone as part of APEC. For Russia, the failure of major integration projects by the US and China could signal the need to revise its mid-term foreign trade policy. So far, the prospects of such an ambitious free trade zone are unclear as the participants are not ready yet to genuinely negotiate, Flegontova said. 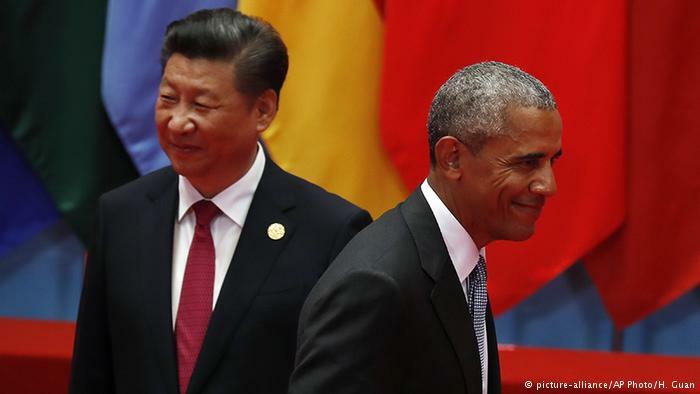 China suggested sealing an agreement by 2020, but the US opposed the plans. Now, Beijing is coming out against the commitments on the TPP and the RCEP in joint declarations. President Obama made a foolish decision to not welcome China in the formation of the Trans-Pacific Partnership (TPP). 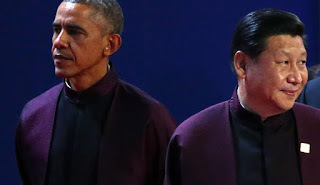 It was ludicrous for Obama to leave China out of things. China is the second biggest economy in the world, third if you treat the EU as a block. Had China been in the deal all along, we may not have seen the ludicrous provision that allowed companies to sue governments. That provision was one of the key reasons the deal failed. With the election of Trump, TPP is officially dead. China, not the US, will be at the center of a new Asian trade pact. In all practical senses, U.S. participation in the Trans-Pacific Partnership is over, at least for now. The Washington Post reported that Senate Majority Leader Mitch McConnell says Congress will not seek to ratify the trade deal during the lame-duck session, essentially the last hope of the Obama Administration to pass the deal. House Speaker Paul Ryan said the GOP does not have enough votes to pass TPP in the House, with soon-to-be Senate Minority Leader Chuck Schumer, D-New York, confirming the deal will not be approved. How did this historic defeat happen? One answer is people-power built around widespread anger over the damage that earlier trade deals, such as NAFTA, have done to America’s manufacturing base and the decent-paying jobs that went with it. China is moving after Donald Trump's election win to claim the mantle of the world's champion of free trade and the fight against climate change, prompting a melancholy warning from President Barack Obama that the US risks getting left behind in Asia. Mr Obama met in Peru on Sunday with leaders of the 12-nation Trans-Pacific Partnership, a trade deal that Mr Trump vowed to kill on the campaign trail along with the Paris Agreement to tackle climate change. Mr Obama said that TPP members told him they want to move forward with the pact, "preferably" with the US. "I believe that TPP is a plus for America's economy," Mr Obama told reporters while attending meetings of the Asia Pacific Economic Cooperation, the first major global summit since Mr Trump's win. 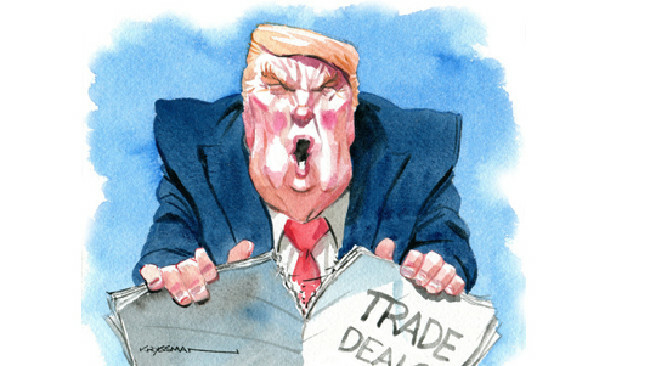 Two months before the inauguration of Donald Trump as the next US President and the likely end of the Trans-Pacific Partnership free trade deal, signs emerge that the Asia-Pacific region is turning towards a Plan B. During his presidential campaign, Donald Trump promised to pull the US out of the 12-nation mega trade deal known as the Trans-Pacific Partnership (TPP), a vital element in President Barack Obama's "pivot" to Asia strategy. The trade deal has been viewed by many as a means for the US to deepen its economic engagement in the Asia-Pacific region, while helping Washington counter Beijing's growing influence. China is currently not part of the TPP. Australia still wants the Trans-Pacific Partnership to succeed even with US president-elect Donald Trump vowing to withdraw from the trade pact, Prime Minister Malcolm Turnbull says. It was up to Mr Trump and his new Congress to make decisions in what they believed was in their nation's interest. "It is very clear that from Australia's point of view, getting greater access for Australian exports ... to those big markets is manifestly in our interest," Mr Turnbull told reporters in Canberra on Tuesday. 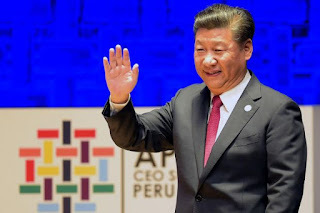 China’s President Xi Jinping during a meeting with Russia’s President Vladimir Putin at the APEC (Asia-Pacific Economic Cooperation) summit in Lima (Peru) said China and Russia should support the process of forming in the Asia-Pacific Region (APR) of a free trade zone. "Russia is an important member of APEC, and both countries should improve cooperation in the framework of this forum, should implement important agreements, reached at the meeting this year, which include consensus reached in Beijing," the Chinese Foreign Ministry quoted the country leader. "The countries should enforce the measures to promote the process of establishing a free trade zone in APR, and also favor successful results of the summit in Lima as we all APEC’s even bigger input in the economic growth within APR and globally." Russia’s presidential press secretary Dmitry Peskov said earlier, "the leaders supported strengthening of cooperation within the APEC for the purpose of delivering Bogor goals [a set of targeted goals for realizing free and open trade in the Asia-Pacific - TASS]." 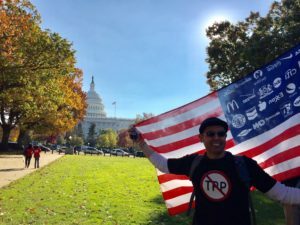 TO THE extent the divided American electorate can be said to agree on anything after Nov. 8, it would seem to be broad rejection of “trade deals” such as the Trans-Pacific Partnership (TPP). Both major-party candidates, Republican winner Donald Trump and Democratic loser Hillary Clinton — as well as her erstwhile primary opponent, Sen. Bernie Sanders (I-Vt.) — opposed it. Not surprisingly, the Senate will not take up the TPP in the lame-duck session. Therefore, there was a certain pathos to President Obama’s valedictory performance at last weekend’s Asia-Pacific economic summit. With Mr. Trump, the most vehement protectionist to win the presidency in recent memory, preparing to take over at the White House on Jan. 20, Mr. Obama urged the region’s leaders not to give up on the TPP or the American presence in Asia that it would embody and perpetuate. Meanwhile, China’s strongman, Xi Jinping, offered membership in its alternative to the TPP, the Regional Comprehensive Economic Partnership, a less ambitious tariff-cutting plan whose main impact would be to substitute Beijing for Washington as the Asia-Pacific region’s economic and, potentially, strategic heavyweight. Abandoning the TPP would be a self-inflicted injury to the United States and its democratic partners, from the west coast of South America to Australia to Japan. 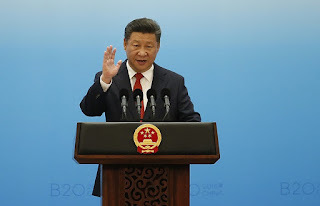 Yet even as the various leaders of those nations declared themselves open to China’s blandishments, they refused to close the door on some new arrangement that might include the United States. New Zealand’s prime minister, John Key, observed that he would consider renaming the TPP the “Trump Pacific Partnership” if it would help bring the new American administration on board; while Mr. Key was obviously joking, his offer to reopen negotiations in search of a bargain that would meet with Washington’s approval seemed genuine enough. Surely no nation in this prosperous, strategically vital area of the world can relish its abandonment by the United States, after 70 years in which the area benefited from American investment, trade and military strength. The door could be opened again for China to join the world’s ­largest regional trade agreement, the Trans-Pacific Partnership, if the US pulls out of the deal, as threatened by president-elect ­Donald Trump. The Australian has been told that during closed-door meetings yesterday among member ­nations of the TPP at the Asia ­Pacific Economic Co-operation summit in Peru, an option of “going it alone” without the US was raised as a “serious” ­consideration. Several of the Pacific Rim leaders had informally agreed they should press ahead to ratify the free-trade deal to reduce tariffs among the 11 remaining members. 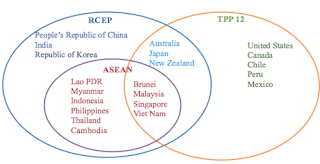 Trade boffins like nothing better than an acronym and the grand plan was to merge the TPP with the RCEP to create a genuine Asian and Pacific trade zone, but now RCEP looms large. The Regional Comprehensive Economic Partnership is China’s response to the Trans-Pacific Partnership and brings India and South Korea to the table to create a genuine ASEAN and Asian trade agreement. Geopolitically it is also important because it is China’s deal and TPP deliberately left China out of the US-led deal. Just how talks transpire remains to be seen, but Australia would be as keen to get involved in the RCEP as it was in the TPP because both serve as great platforms for future deals. An ambitious Asia-Pacific trade pact linking the United States and 11 countries lay in tatters on Tuesday after U.S. President-elect Donald Trump said he would kill the deal on his first day in office on Jan. 20. Trump's statement appeared to open the way for China to assume the United States' leadership mantle on trade and diplomacy in Asia. The Republican termed the Trans Pacific Partnership (TPP) "a potential disaster for our country." Beijing is more than pleased about Donald Trump turning his back on a major U.S.-led Pacific trade pact. Ian Bremmer, president of the global intelligence firm Eurasia Group and a closely watched political scientist, said Wednesday that officials in China are excited about President-elect Trump's plan to withdraw from U.S. participation in the planned Trans-Pacific Partnership. The proposed free-trade bloc would have included 12 countries accounting for more than a third of global trade. 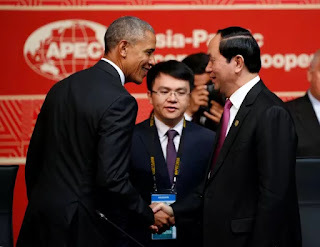 President Barack Obama and others had argued that the TPP deal was a way for the United States to continue to assert its leadership — especially in the face of an increasingly powerful China that is eager to replace the U.S. as the main power in the region. Trump's apparent killing of the TPP creates a geopolitical vacuum in the eyes of both Beijing and American allies, Bremmer said. China will “play its role” in promoting economic integration in the Asia-Pacific, the foreign ministry said on Wednesday, after U.S. President-elect Donald Trump said he would kill an ambitious regional trade pact. 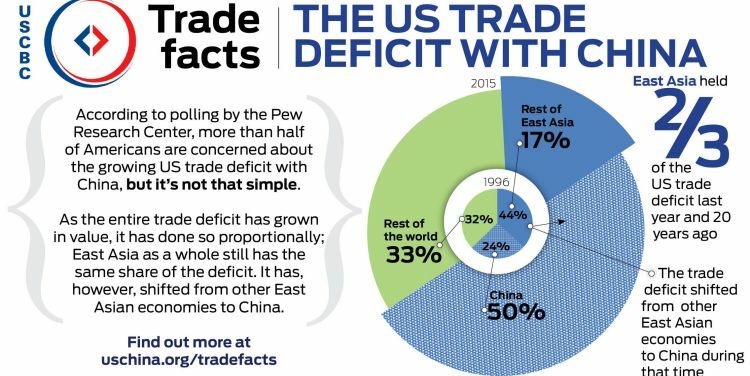 In 2015, the total U.S. trade deficit was $531.5 billion. That’s because it imported $2.7618 trillion of goods and services while exporting $2.2303 trillion. 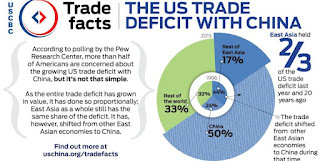 The trade deficit with China is responsible for at least 40% of the total U.S. deficit in goods. U.S. goods and services trade with China totaled $598 billion in 2015. Goods exports totaled $116 billion; goods imports totaled $482 billion. The U.S. goods trade deficit with China was $366 billion in 2015, a 6.6% increase ($23 billion) over 2014, according to the USTR. In the first ten months of 2016, the deficit was $259 billion. American imports of Chinese goods have fallen 6.1 percent year-to-date. U.S.-China economic ties have expanded substantially over the past three decades. Fourteen years ago, on December 11, 2001, China acceded to the World Trade Organization. Membership provided incentives to ratchet up productivity-enhancing infrastructure investments which caused labor productivity to soar. Over the past 10 years of so, China has been one of the fastest-growing U.S. export markets. The cumulative U.S. trade deficit with China since it joined the WTO is a staggering $3.5 trillion, according to the U.S.-China Economic and Security Review Commission. As it protects its domestic industry from foreign competition, China continues to dump its massive overcapacity in U.S. and other global markets, materially damaging U.S. industries, including steel. China was the United States’ 3rd largest goods export market in 2015. U.S. goods exports to China in 2015 were $116 billion. U.S. exports to China account for 7.7% of overall U.S. exports in 2015. The top export categories in 2015 were: aircraft ($15 billion), electrical machinery ($13 billion), machinery ($12 billion), miscellaneous grain, seeds, fruit (soybeans) ($11 billion), and vehicles ($11 billion). U.S. agricultural exports to China have grown more than 200 percent over the past decade and China was the United States’ second-largest international market in 2015, according to the USTR. Leading categories include: soybeans ($11 billion), coarse grains (ex. corn) ($2.1 billion), distillers grains ($1.6 billion), hides & skins ($1.3 billion), and cotton ($870 million). U.S. exports of services to China were an estimated $45.4 billion in 2015. TPP versus RCEP: What future norms for free trade in the Asia Pacific? 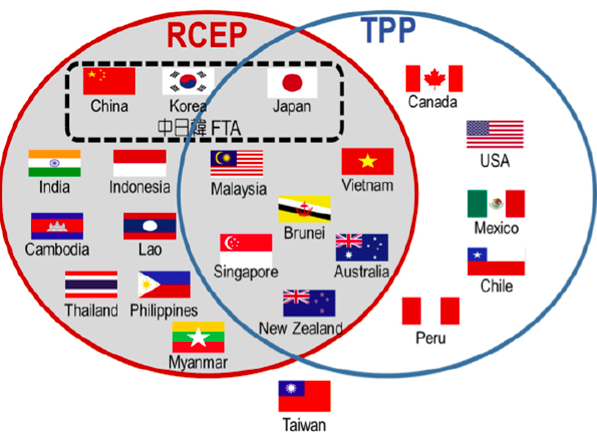 PECC - TPP vs RCEP? - Competitor or Complements? TPP vs RCEP : ความตกลงฉบับไหนดีสำหรับไทยและอาเซียน? 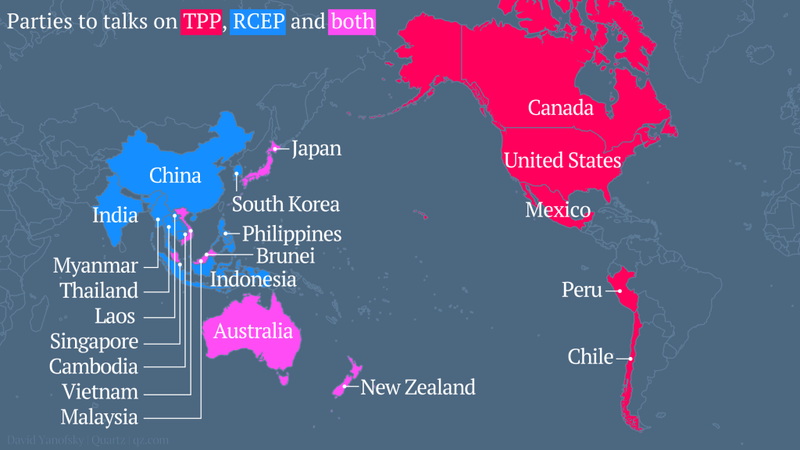 TPP trade deal: Who are the winners and losers? Trump Says TPP Trade Is Toast: What Will China Do? What Asia-Pacific trade pacts could replace the TPP? Is Trump about to trigger a global trade war? Despite strong historical and cultural ties to China, the tiny state of Singapore has found itself in Beijing’s crosshairs, in part for its stance over territorial disputes in the South China Sea. As other Southeast Asian leaders lined up to meet President Xi Jinping at a summit in Beijing this week for his Belt-and-Road Initiative, Singapore was represented by National Development Minister Lawrence Wong. 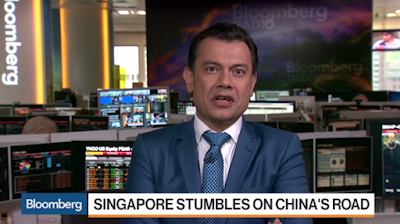 China views Singapore as being less supportive of Xi’s plan because unlike other countries that announced their leaders would attend without requiring a formal invitation, Singapore sought an invite, according to people familiar with the matter. They asked not to be identified because of the sensitivity of the information. China’s Ministry of Foreign Affairs didn’t immediately respond to a request for comment. “I wouldn’t say we have major problems; we’ve had some issues and some incidents,” Singaporean Prime Minister Lee Hsien Loong has said of China, in an interview aired by the BBC in March. Are MRT escalators too fast for the elderly? Congratulations to President-Elect Donald Trump!